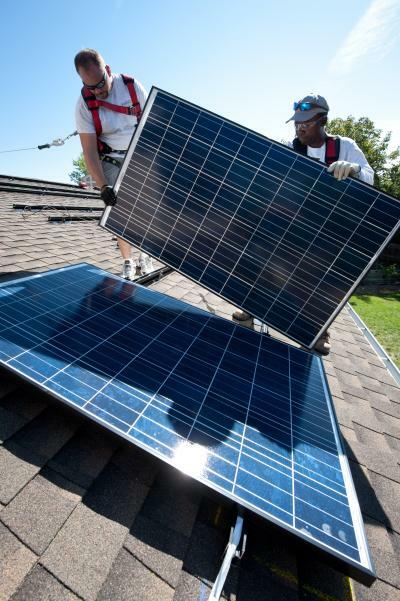 Brian Webster (left) and Mario Richard install photovoltaic (PV) modules on an Englewood, Colo., home. Manufacturing and installing solar panels require large amounts of electricity. But Stanford scientists have found that the global PV industry likely produces more electricity than it consumes. For the first time since the boom started, the electricity generated by all of the world’s installed solar photovoltaic (PV) panels last year probably surpassed the amount of energy going into fabricating more modules, according to Michael Dale, a postdoctoral fellow at Stanford’s Global Climate & Energy Project (GCEP). With continued technological advances, the global PV industry is poised to pay off its debt of energy as early as 2015, and no later than 2020. The achievement is largely due to steadily declining energy inputs required to manufacture and install PV systems, according to co-author Sally Benson, GCEP’s director. The new study, Benson said, indicates that the amount of energy going into the industry should continue to decline, while the issue remains an important focus of research. To be considered a success – or simply a positive energy technology – PV panels must ultimately pay back all the energy that went into them, said Dale. The PV industry ran an energy deficit from 2000 to now, consuming 75 percent more energy than it produced just five years ago. The researchers expect this energy debt to be paid off as early as 2015, thanks to declining energy inputs, more durable panels and more efficient conversion of sunlight into electricity. If current rapid growth rates persist, by 2020 about 10 percent of the world’s electricity could be produced by PV systems. At today’s energy payback rate, producing and installing the new PV modules would consume around 9 percent of global electricity. However, if the energy intensity of PV systems continues to drop at its current learning rate, then by 2020 less than 2 percent of global electricity will be needed to sustain growth of the industry. This may not happen if special attention is not given to reducing energy inputs. The PV industry’s energetic costs can differ significantly from its financial costs. For example, installation and the components outside the solar cells, like wiring and inverters, as well as soft costs like permitting, account for a third of the financial cost of a system, but only 13 percent of the energy inputs. The industry is focused primarily on reducing financial costs. Continued reduction of the energetic costs of producing PV panels can be accomplished in a variety of ways, such as using less materials or switching to producing panels that have much lower energy costs than technologies based on silicon. The study’s data covers the various silicon-based technologies as well as newer ones using cadmium telluride and copper indium gallium diselenide as semiconductors. Together, these types of PV panels account for 99 percent of installed panels.